I was delighted when the nice folks at FreshJax reached out and asked if they could send me some of their lovely spices to try. Thought I’m definitely a “fusser” when it comes to baking and snacking, I really try to make our main meals as simple and stress-free as possible. A big part of that is relying on ingredients that pack a punch flavor-wise, to get the very most out of as few components as possible. It’s no surprise, then, that spices rule in my kitchen. And whether I combine them together (like my fave “everything” spice), or use them individually, fresh, flavorful spices are VIP’s. Which is why I’m delighted to now have a pantry full of FreshJax! FreshJax is a small, family-owned company that started with organic sauces and spices sold in local farmer’s markets. Within a year, demand grew and a company was born. FreshJax spices are handcrafted in small batches, using only pure, organic spices, herbs and salts – with zero fillers, anti-caking ingredients, MSG, dyes or chemicals. They’re also vegan, gluten-free and certified Kosher. The first spice that caught my eye was the Tofu Scramble Spice Mix. 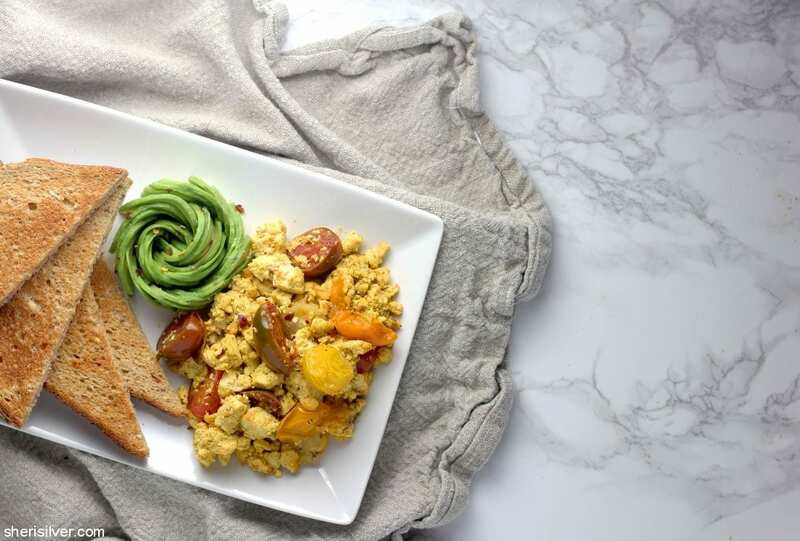 A tofu scramble is a staple in any vegan kitchen, and we are no exception. 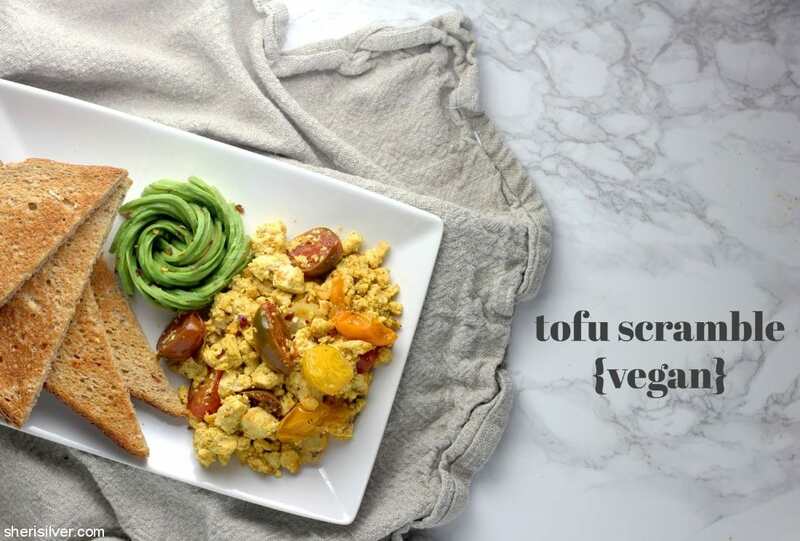 So what IS a tofu scramble? Well, it’s exactly what you’d think – a tofu dish that is the vegan equivalent of scrambled eggs. It can be served over greens, on toast or in a breakfast burrito – and when done right, is really delicious. The secret? Turmeric and nutritional yeast. 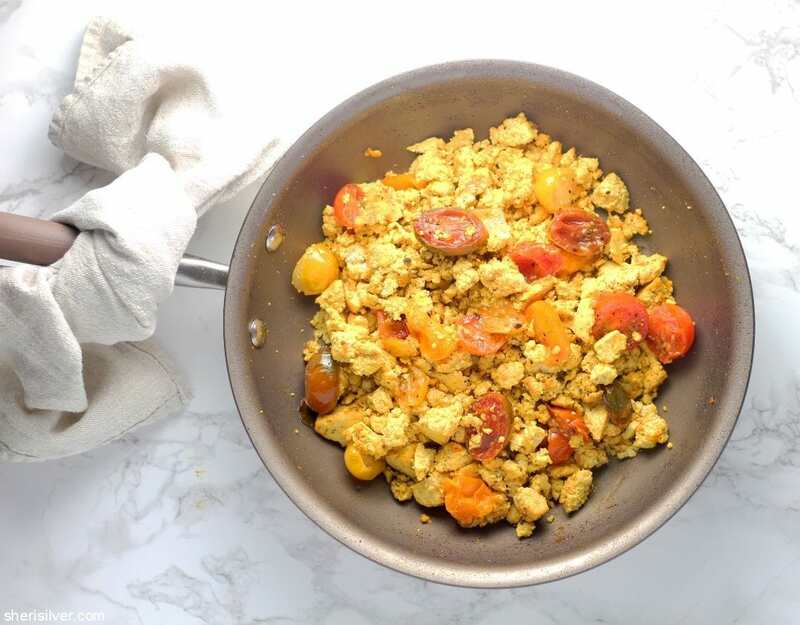 Turmeric gives the scramble a warm flavor and the traditional hue we associate with this dish. And nutritional yeast? Well it’s one of the most important ingredients in the vegan pantry. It’s a dairy-free topping that has a surprisingly cheese-like flavor, and can be sprinkled on roasted veggies, popcorn, pasta – you name it. It’s a key component in my vegan parmesan and stuffed shells, as well as my (according to Chelsea) “killer” mac and cheese (coming soon here it is)! 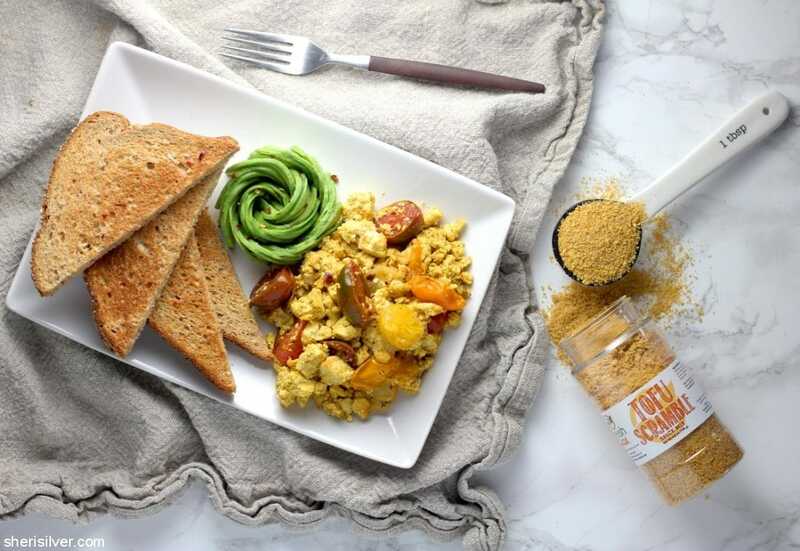 FreshJax’s Tofu Scramble Spice Mix contains both turmeric AND nutritional yeast, along with other spices to make this the only ingredient you’ll need for a perfect scramble yourself. 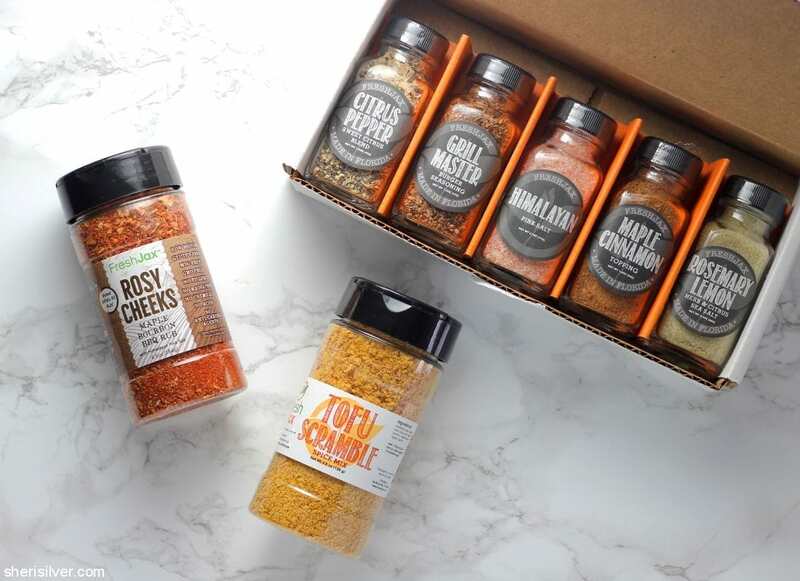 I’d love you to try FreshJax spices too, and have a 15% discount code to get you started! Buy a few full sizes of your most-used spices, try something new, or create your own “mini” set of 5 (which makes a perfect gift too!). Simply enter code sherisilver at check-out. And stay tuned for more recipes featuring FreshJax in the coming weeks! Heat olive oil in a medium skillet over medium-high heat. Saute your mix-ins, if using, and transfer to a plate. Add a bit more oil and crumble in the tofu. Add the Tofu Scramble Spice Mix and cook, stirring to warm through, for 3 – 4 minutes. Return your mix-ins to the pan and stir. Serve immediately, with desired accompaniments. More vegan recipes on Pinterest! Note: I was not compensated for this post. FreshJax gave me several of their spices to try; all comments and opinions are – as always – completely my own.